What a packed Bank Holiday weekend we had! It was great fun and we could not have asked for better weather. Saturday saw us walk from Kew Bridge to Twickenham along the Thames towpath. It is such a gorgeous walk, which passes by Kew Palace, Syon House and Ham House. Amazingly, we managed to pop into Kew Gardens for lemon drizzle cake. What luck! There were boat races going on too, so that provided some welcome entertainment. 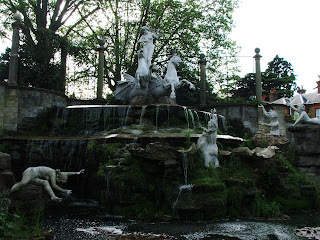 On the way to get the train home, we found some gardens with a gorgeous fountain. We had no idea it was there until we saw the statues through the fence as we walked by. Talk about hidden treasures! On Sunday, we decided to take the train out to Windsor in the morning. Not the best timing really, as it was packed with rugby supporters heading to Twickenham. However, we eventually got there in one piece. We wandered down to Eton first and investigated the College (from the outside as it was closed for maintenance), which is really quite something. Then it was time for some lunch beside the river. It was bliss sitting in the sun watching the boats going along the river. 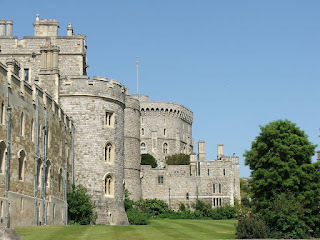 Afterwards, we walked round to the Long Walk leading down from Windsor Castle and lay on the grass for a little while. I'd have liked to go into the Castle but St George's Chapel is closed on Sundays (except for worship), so we're going to go back on a Saturday. Perhaps we'll go when my parents are here in a few weeks. Back to work now. Funny how four day weeks at work feel twice as long as usual weeks! I'm a busy bellydancing bee at the moment. Admittedly, I did have a lazy week last week but the next few weeks will more than make up for it. I've got a Tribal Fusion workshop on Saturday with the wonderful Darkstar. It's going to focus on pops and locks before putting them together in a short choreography. I'm really looking forward to learning more about muscle isolations and drills to strengthen them. At the end of May, I've signed up to do a full day of workshops as part of Fire in the Belly. I'm not 100% sure I have the stamina for it, but I could not miss the chance of learning to work with fire props. It's something I've toyed with learning for a number of years. However, the opportunity never arose to indulge my pyromaniac side. Now that it has, I could not turn it down. As well as the workshops on dancing with fire props, there is a fan veil workshop that I am doing too. Loads of new toys to work with! As well as workshops, I have my ATS class that I am getting so much out of. I really wish I could get a little practice group together to work on leading/formations etc. I might have to speak to some of my classmates and post on some forums to find some SW London ATS addicts. I'm still working on my Egyptian/Cabaret style at home and I'm trying to focus on layering drills to tighten up my technique. I'd also like to really try doing some little choreographies but I never know where to start! There has been lots of stuff happening here over the last few weeks. I've spent a lot of time at Kew Gardens. Last weekend I went by myself while G was studying. I really needed to get some space to myself and time to work through some of the things happening in my life right now. I discovered the rhododendron dell in full bloom and loads of beautiful bluebells. This weekend, I insisted on taking G and we discovered the lilac garden. The smell was truly divine! We've also been to the cinema a few times. We went to see Coraline 3D last weekend. 3D has come such a long way from the silly paper red/green specs. It looked amazing and was suitably creepy. On Sunday, we went to see Star Trek on the IMAX screen. It was my first time seeing anything in IMAX - all I can say is WOW! I actually really enjoyed the film. I thought it was nice that they threw the timeline out of the window and did something a bit fresh. On a boring work related note, I have managed to get a new job. It's still at my current place of work but it's more responsibility and more pennies. I think it's going to be a lot more challenging and a lot less boring than my current job. It's working on a hugely high-profile project too. As per usual, it's not perfect but it's closer to perfect than the current job.